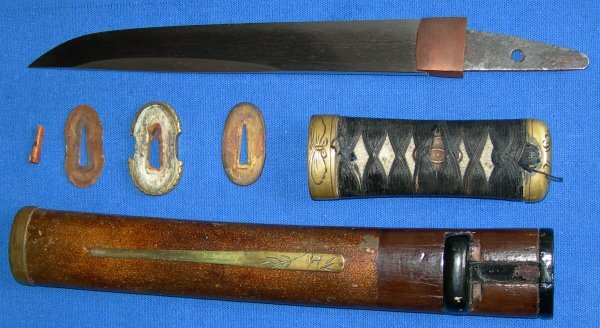 A very good Shinto / Shinshinto Hamidashi Tanto, very good Asaki-notare ha hamon with Masame Jihada in high state of polish, most likely made by a swordsmith of the Matasune branch of the Owari Seki School. 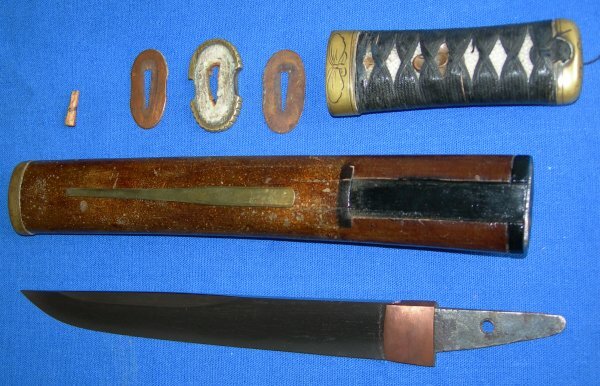 A very well made Shinto or possibly Shinshinto Hamidashi (with tsuba) variant of a Japanese tanto. The 7 1/2 inch (cutting edge) hihira-zukuri blade is in very good condition (high polish), the Masame forge lines particularly pleasing, very strong Asaki-notare ha hamon. The Kogai (smallest knife) is present, the Kozuka / Gokatana (slightly larger knife) is missing (replacement easily sourced online if required). The furniture generally of high quality and in aged reasonable to good condition.